Gas supplies from Hungary to Ukraine have increased tenfold to a record 7.4 million cubic meters per day on Monday, up sharply from 720,000 cubic meters per day on March 7-12, the Ukrainian gas transportation network operator Ukrtransgaz said. “As of 6:00 [04:00 GMT] on March 16, daily natural gas supplies to Ukraine from Hungary amounted to 7.4 million cubic meters. From March 7 to March 12, when gas supplies from Hungary were increased, the deliveries stood at 0.72 million cubic meters per day," Ukrtransgaz said in a statement on its website on Monday. Ukraine’s has imported 52 million cubic meters from Hungary in the first half of March, the operator added. 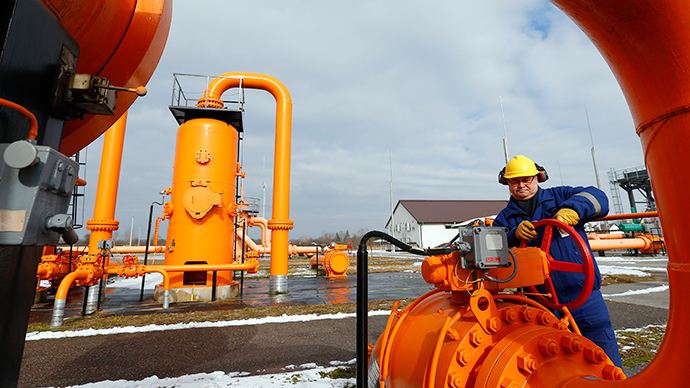 Last year, Ukraine imported 600 million cubic meters of gas from Hungary. The statistics from Naftogaz come at a time when Ukraine is seeking to diversify away from Russian supplies. The new gas conflict with Moscow could trigger another cut-off. Meanwhile, Kiev says it’s going to cut imports from Russia to zero and buy gas in reverse schemes from other western countries like Slovakia and Poland. Last week, President Petro Poroshenko blamed Russia for charging Ukraine 15 percent more for its gas than the countries in Europe and said he would get gas in reverse supplies from Europe at $245 per 1,000 cubic meters. Ukraine, where the economy is in a full-blown crisis, now pays for Russian gas in small tranches. The last one – $15 million – was made on March 6 and is supposed to last through March 15, but since then, Gazprom has not received any new payments.